If you have not read the last article, it would be helpful to review it in order to get familiar with the problem I was trying to solve. 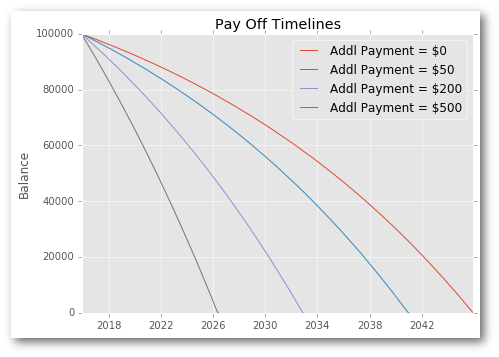 As you can see in the comments, my solution was not correct because I failed to re-calculate the schedule based on the principal reduction from additional principal payments. Basically, I need to recalculate the values each period - which looks like a looping process. Unfortunately, this was what I was explicitly trying to avoid. Based on comments from several knowledgeable readers, I think the best solution is to use a generator to build up the table and return it in a format that can be easily converted to a pandas dataframe. The benefit of the generator is that it gracefully handles the situation where the loan is paid off early due to additional principal payments. If you are not familiar with python generators and their usage, this post is helpful. The first step in the updated solution is to build the amortize function which effectively loops through each period and returns an OrderedDict which can be easily converted into a pandas dataframe. The nice aspect of this solution is that the generator approach builds up the results in an incremental manner so that you do not have to try to determine how many iterations you need in advance. Essentially, the code keeps calculating the end_balance each period until it gets to 0 and the generator is complete. When will the balance be paid off? 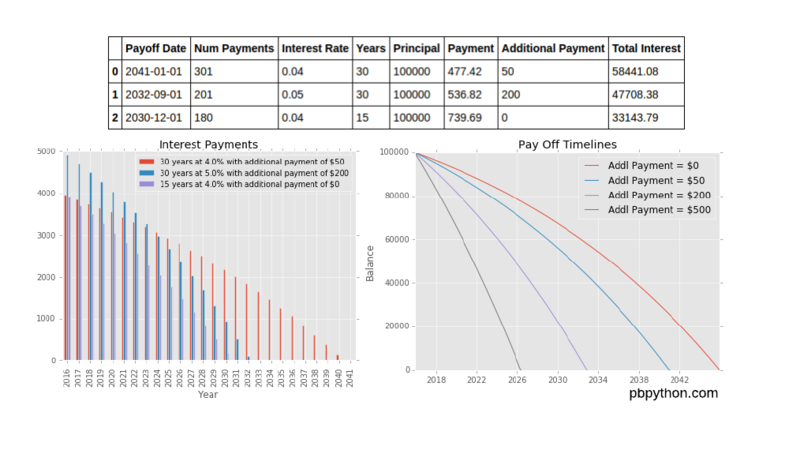 How much in interest do you pay over the life of the loan? I made the mistake of thinking I knew how the pre-payment process worked but I was obviously mistaken. If I spent a little more time building up a prototype in Excel and validating the results ahead of time, I would have caught my errors much earlier in the process. I decided that I wanted to make the solution in pure-pandas without any looping. In reality, I should have thought about the entire problem and all of the options available in the python ecosystem - including the standard lib. While pandas has a lot of great tools, the python standard library is really rich and provides many capabilities that can solve a wide variety of problems. So many places on the Internet can be hostile. However, I am very impressed with how many people publicly and privately offered their support to help me fix the issue. Everyone that reached out to me was doing it in the spirit of trying to help me understand the problem and build a better solution. I appreciate their patience and willingness to work with me on finding a better approach. Several people spent much of their own time looking at my proposed fix and offering their ideas on how to improve. I went into this article series trying to learn more about using pandas. However, I actually had a chance to learn and use generators for a real life problem. As a result I do understand python generators much more and understand why they are a good solution to this type of problem. I also spent some time pondering how to use python’s min and max functions to simplify some of my code. Even with a bit of a stumble in this process, it has been a good learning experience and I hope it will be for many of you as well.